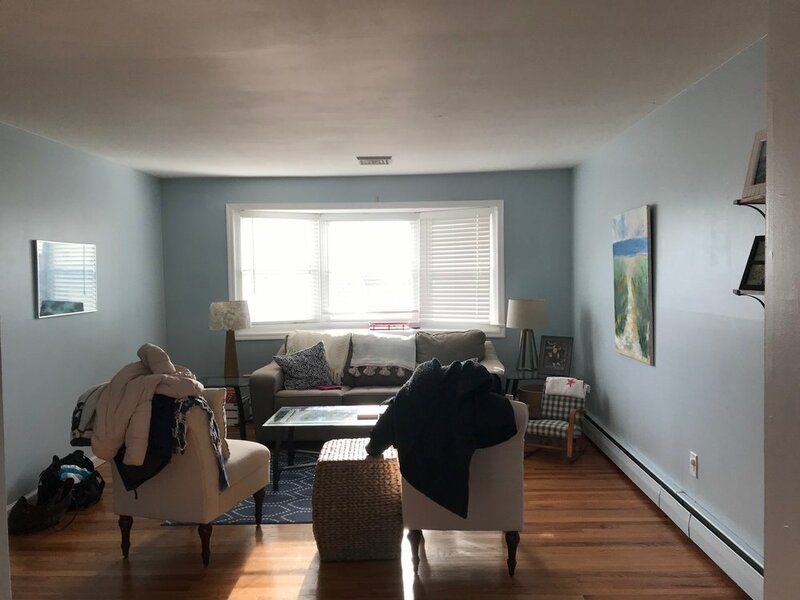 I posted a couple of weeks ago about how I’m helping my sister + her husband update their beach house living room (see post here in case you missed it!). Well I went down there this past Saturday and we made HUGE progress! I got down there about an hour or so before they did, so I had that time to myself to try out a couple different arrangements. Originally I thought there would be enough space to have a bar cart on the small wall to the right of the opening to the dining room. However, when I got there and saw the space in person, it felt too crowded and didn’t leave enough space for traffic. I moved the bar cart to the opposite corner and positioned it sort of on an angle, pulled out a little bit from the wall. This arrangement worked out better to me anyway because I felt like that corner next to the sofa needed something with a warm tone. This is one reason why my number 1 piece of advice when designing a room is to only buy a few bigger items at a time. Sometimes, no matter how much measuring you do, it’s just too hard to accurately imagine how something will work. When I got to their house, they had the side tables next to the sofa + chaise switched around as well. I didn’t get that great of shots of the tables, but you can kind of see in the two photos above how the table next to the chaise is way bulkier than the one next to the sofa. I made this switch because the scale of the skinnier table next to that big chaise felt a little off. I also like the contrast of the off white chaise + tan woven table and the brown sofa + white table. I already knew that I wanted to hang a plant over the chaise, and it ended up looking great. I bought this hanging planter at a wicker shop that’s close to my house, but Urban Outfitters sells one just like it. I love how it bridges the gap/empty space between the top of the chaise and the ceiling. More wall art could have made this corner feel a little cluttered. My sister spray painted the metal brackets to the wall shelves they already had. Making them white made a HUGE difference, I feel like the white even brings out the pretty tone of the wood even more! We weren’t quite sure where to put the shelves at first, I’m glad we decided on this spot though. They don’t compete with the art above the sofa, and the simple styling actually compliments it. My sister had already moved this painting she did (she’s an incredible artist!) to this wall and I love it here. The blues, greens, yellows, and tans fit right in and the scale of the canvas is perfect. I put this floor lamp here because I like the height it adds. I wasn’t positive what to do with that wall behind the chairs at first. Then I remembered that my sister has a ton of pretty straw hats and thought that putting three of them in a straight line would look really cool here. My original thought was to get some pretty wall hooks either from Anthropologie or maybe the newer rattan hooks that IKEA has. We ended up using command hooks just so we could see what they would look like- and I kind of think that they’re perfect (command hooks and all)! Though, she actually wears these hats so she will probably still want to replace the command hooks with cute ones! Here is a pretty good before and after shot of the space. You can see how adding a bigger, light colored rug as well as changing the orientation of the furniture has made this room feel like a totally difference space! We just need to find the right throw pillows for the chaise + sofa (most of the ones in the photos were borrowed from my house). We’re also going to give the dining room a mini makeover - new light fixture and maybe wall art, and I’m also trying to find a great Turkish rug for her entry hallway! Be sure to check back here and follow me on Instagram to keep up with the latest updates! I’ve linked up some of the products we used (or similar ones) below - but always feel free to reach out to me if you have a question about the source of a product not listed!